Applying for and gaining your first post can be an anxious time. While getting the job is essential, it is also important to consider what an employer can offer that will ease the transition from student to registered nurse. The Department of Health has published key principles for preceptorship, and preceptorship programmes are advocated by the Nursing and Midwifery Council. Most employers now offer them, but the quality and length of programmes vary. Preceptorship is intended to support students as they adapt to the realities of being a registered practitioner. 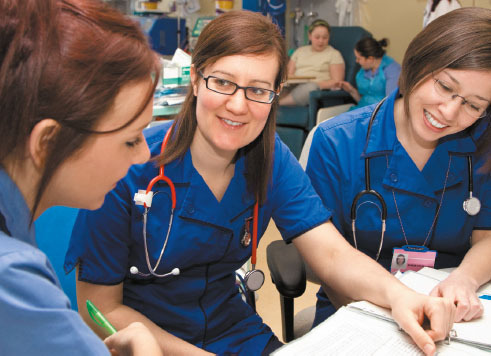 The NMC acknowledges that newly registered nurses will not have all the necessary skills on qualifying – these will be developed through the preceptorship period and beyond. Choose an employer that offers a well-structured programme. Ask existing staff for their perspective and explore the organisation’s website to see the content of their preceptorship programme. Ask about the programme at interview. Prepare for the first preceptorship meeting. Review feedback from your mentors – are there common themes about areas that can be developed? Examine the job description, think about the clinical area you will be working in and list the knowledge and skills needed. A SLOT analysis can help identify strengths, skills, learning needs, opportunities (for using existing skills) and any threats (concerns). The list of skills to be learned will probably be long, including medicines management, cannulation, delegation and time management. Preceptors can help prioritise learning needs. Establishing a good relationship with your preceptor is important. Regular meetings to identify learning needs and monitor progress will be familiar, but the emphasis now is on the nurse taking responsibility for the process. Some employers have a set of prescribed competencies for new staff to achieve, while others might use clinical supervision as a development tool. The preceptorship period is another stage in a process of lifelong learning with the variations in confidence that accompany new challenges. With the right support you can meet these challenges.